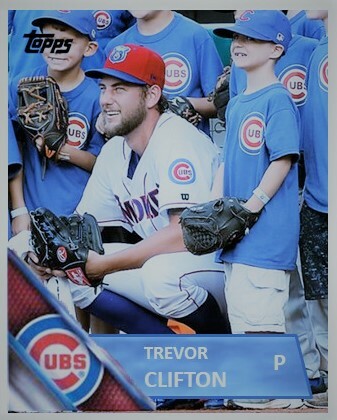 A Preview of Trevor Clifton’s AAA Debut – Now, Where Did I Put My Kleenex? Tonight in Iowa, pitcher Trevor Clifton will make his AAA pitching debut. I am very excited to watch him pitch. Now that he’s just one step away from Chicago, it’s a bittersweet night. His journey to AAA has been thrilling and frustrating as he’s learned to adapt at every level, something he will need to do in Chicago. Wow! He’s that close. Sorry, I got a bit distracted by how far the 23-year-old has come since he was a 12th round pick back in 2013. It’s easy to remember when you see a prospect for the very first time, especially when you are excited about their talent. When Trevor Clifton debuted for the Boise Hawks in 2014, the excitement of broadcaster Mike Safford came through over the Internet. It wasn’t until Clifton pitched at Hillsboro that July did I get to see him for the very first time. Once I got past those uniforms, there was a lot to like. What was evident early what was the potential. He had a mid 90s fastball, a looping curve back then, and a lot of room to fill out. He was a pretty skinny 19-year-old. When he got to South Bend the next year, Clifton put on some weight but began to struggle a bit in June of 2015. After a suspension in a bench-clearing brawl, Clifton came back and began a stretch of great pitching that summer that lasted for two years where he ascended to the top 10 on most Cub prospect lists. He was even named the Cubs Pitcher of the Year in 2016 while at Myrtle Beach after a season in which he put up a 2.72 ERA and struck out 129 in 109 innings. Last year at Tennessee, he had a great first half with a 2.84 ERA in 12 starts and was named a Southern League All-Star. It looked as though he was about a month away from heading to Iowa. Then all the wheels fell off. He struggled most of July and into August before he was shut down for the season after his August 21st start..
It’s a bit of a change to go from a six man rotation down to five. But for Clifton that wasn’t the issue. Part of me thought it might be something mechanical was going on or maybe something just got in his head. Whatever the reason, It doesn’t matter now. He’s bounced back. Clifton started 2018 with a decent April in which he had a 3.96 ERA. Outside of one inning, he gave up just 3 runs in the other 24 frames (1.13 ERA). For May, he put up a 2.36 ERA in 26.2 IP with 25 Ks. To be frank, 2018 Trevor Clifton looks like Trevor Clifton of old. The guy that really took off in July 2015 looks to be like the same guy pitching for Tennessee in 2018. The curve ball is a little tighter, his change has a little more fade, and his fastball still explodes about 10 feet from the plate. Not every prospect’s journey to the big leagues is a straight shot. What I like this year is there seems to be some sort of maturity going on. He’s able to get past mental hurdles when he gives up one or two runs to start the game and then he just settles down and can go for five more innings of shutout baseball. He’s not been an arm that will give up a run here or there. Teams either hit him or they don’t. They either get to him early or they get to him late or they don’t get to him at all. I loved how hard he has worked this off-season to get back to where he needs to be to pitch good baseball. I’ve always enjoyed the swings against him. Seeing him live, he’s at his best when he’s loose, fluid, and not really thinking about what he’s doing. He’s just getting the signal and throwing it to the catcher and letting his natural abilities do what they do. The biggest thing that he has going for him is that he can be a dominant pitcher because of the late movement on all his pitches. He can throw 93 or 95, but those numbers don’t matter. When he takes the mound tonight, I will be excited to see how he does. I might be a bit misty.